In its search for the beauty of forms, classicism has traditionally been associated with the canon, the arithmetic model, in sculpture as well as in architecture and poetry (metre). In this and other works reproduced at www.jrtrigo.es, the beauty of painting results from a correlation of themes (somewhat analogous to musical motifs); thus, we can consider a figurative form (representing some real or imagined object) also to be an abstraction of what it represents and view it in terms of its orientation (vertical, horizontal or oblique), which then might be imitated in other lines parallel to it at similar angles, or inverted by perpendicular lines, and so forth. As much can be said for its colours: a painting is in a way a “logical” ?or organic? development of a few basic colours, with which the full range of chromatic functions are explored: these colours may then be imitated, or slightly varied to achieve subtle tonalities; in other cases, inverse colours are used, the so-called “complementaries”. 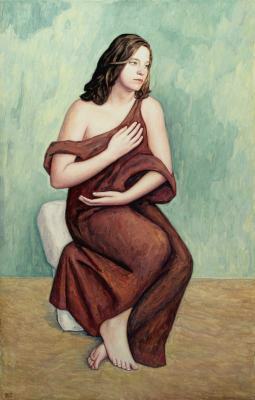 Such an approach could well be called abstract, as it employs modes of expression characteristic of non-figurative art; however, its inextricable unity with the representational enhances the significance of the various elements comprising the work and introduces us –frequently– to the language of symbols. “I believe that symbolic language is the one foreign language that each of us must learn” (Erich Fromm). To a great extent, painting such as this presents us with a synthesis of what are typically referred to as the figurative and the abstract.